What is Assessment PRO Specialty TestsTM? Need to review a provocative test you haven’t seen in years? Too busy to dig through textbooks or research articles? No luck finding relevant info on the web? Picture yourself using an app that provides provocative therapy tests and techniques at your fingertips. A fast, easy and convenient reference tool to fit your busy schedule. As a therapy professional, the ability to look up clinical data instantly can make your job much easier – and that’s where this app comes in. Assessment PRO Specialty TestsTM is a powerful pocket reference tool enabling you to make an evidence-based differential diagnosis within minutes. 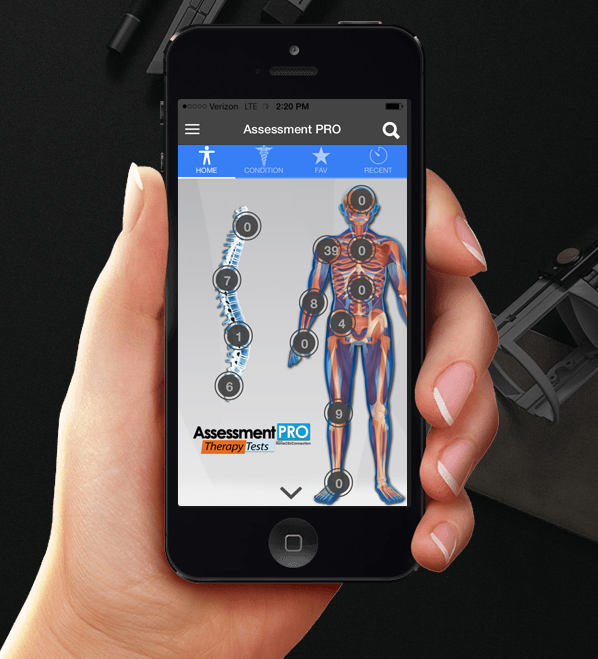 Assessment PRO Specialty TestsTM is a no frills video library of provocative tests to aid health care professionals in diagnosing musculoskeletal and orthopedic disorders. How? Assessment PROTM contains an expansive repertoire of hundreds of therapy tests. It’s very easy to search and navigate, with referenced-supported information on provocative testing maneuvers and their clinical relevance. Assessment PRO Specialty TestsTM is available for free download exclusive to our client partners. Want to join the CEU360 family? See it all for yourself.